At the end of the sixteenth century people were convinced, that an unknown landmass existed somewhere on the southern hemisphere to provide a counter-balancing weight for the large landmasses that were known to exist in the northern hemisphere. This seemed reasonable at the time, as otherwise the earth would topple due to imbalance, which was not happening. It was named Terra Australis Incognita or Magellanica in Latin or The Unknown Southland in English. When exploration trips did not yield any Southland but showed sea lanes existing in positions where the Southland was expected to be, the solid Southland delineation provided on maps and charts of the time, slowly dissolved over about two hundred years, finally disappearing altogether, both from the maps and the minds of people. Tierra de Fuego matured this way from a land bridge connecting South America to the Southland into a part of the Southland and finally into a huge island at the southern edge of South America, unconnected to any Southland. 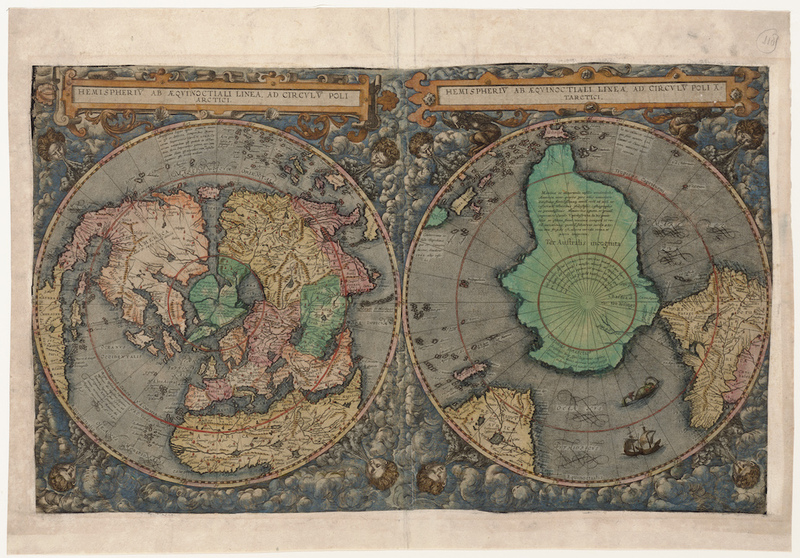 This 1595 world map by Ortelius shows the assumed (im-)balance, with an Arctic layout as per Mercator 1569, the known lands of North America, Europe and Asia and only part of Africa and South America as a compensating effect in landmass. The Antarctic counterweight is shown, leaving only the then known interconnections between the oceans south of the Cape of Good Hope and Magellan Straits. 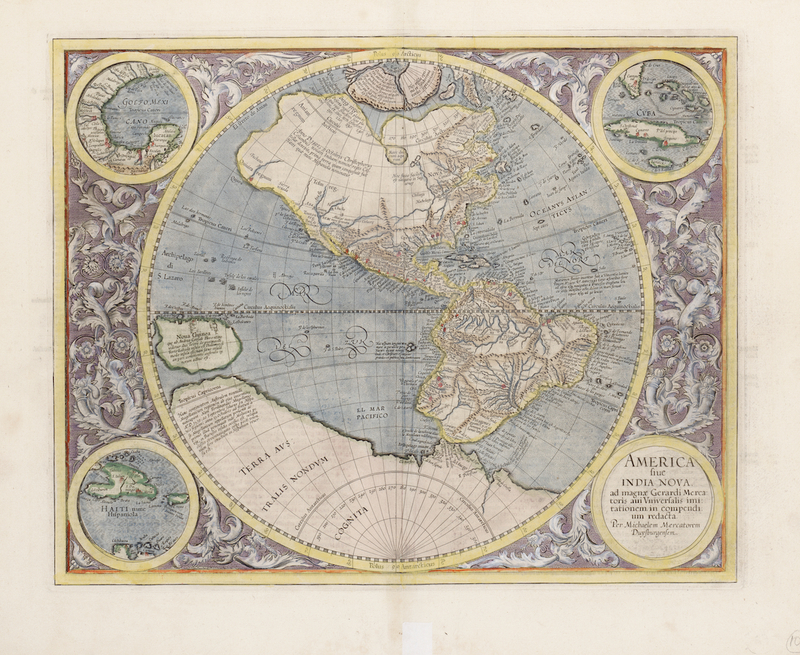 HEMISPHERIUM AB AQUINOCTIALI LINEA AD CIRCULUM ANTARCTICI, World map G. de Jode, 1593, right half. The map image shows the Terra Australis Incognita, making due note of Magellan Straits, but leaves C. de Fuego attached to the Southland The left half seems to emphasise the land mass excess on the northern hemisphere. 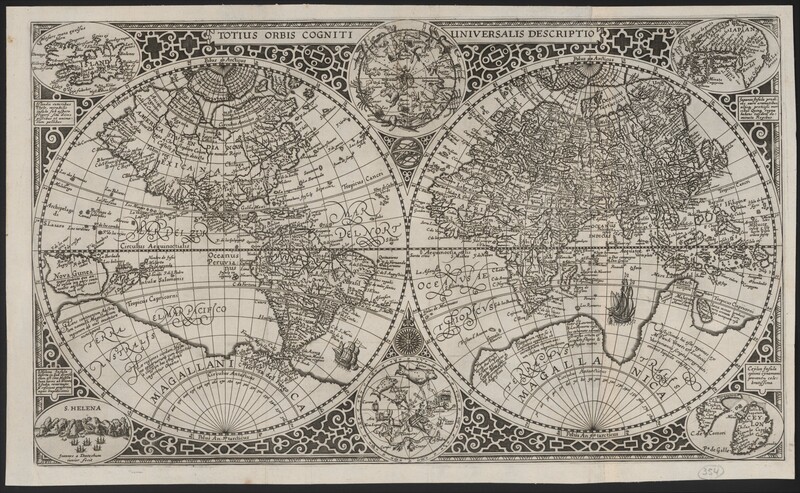 This world map by Paulus Merula, Professor at the Leiden University, dates from 1606 and clarifies the Southland (MAGALLANICA) shape in a two- hemisphere presentation The outline is very much in agreement with Ortelius’ 1595 rendering. The map shows its relation to the Petrus Plancius world map, which in itself goes back to earlier maps of Iberian origin The corner insets show Iceland, Japan, St. Helena and Ceylon, items of interest in those days Note the protruding extension of Terra Australis to the south of Java/Indonesia. It is named Beach and shows up on many early charts; sometimes explained away as a (too) early sign of modern-day Australia. 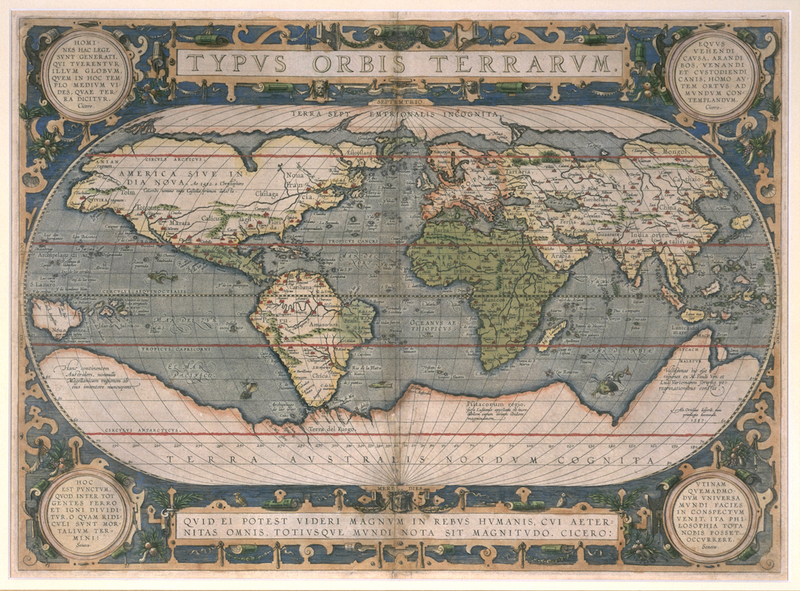 Terra Australis is identified as Terra del Fogo in this 1606 Mercator-Hondius map. Only Straits of Magellan separates South America from the Southland. AMERICA SIVE INDIA NOVA AMERICA ad magnae Gerardi Mercatoris. 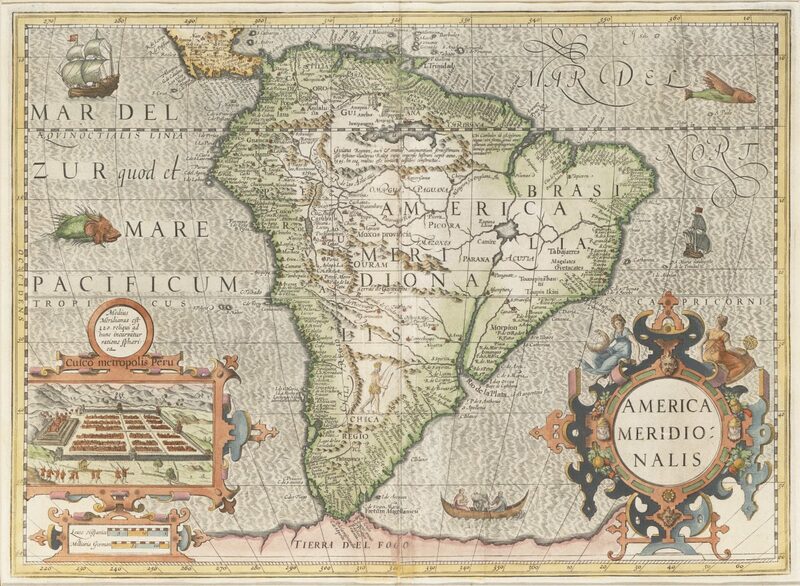 This maps was issued in 1595 by Mercator’s son Rumold. 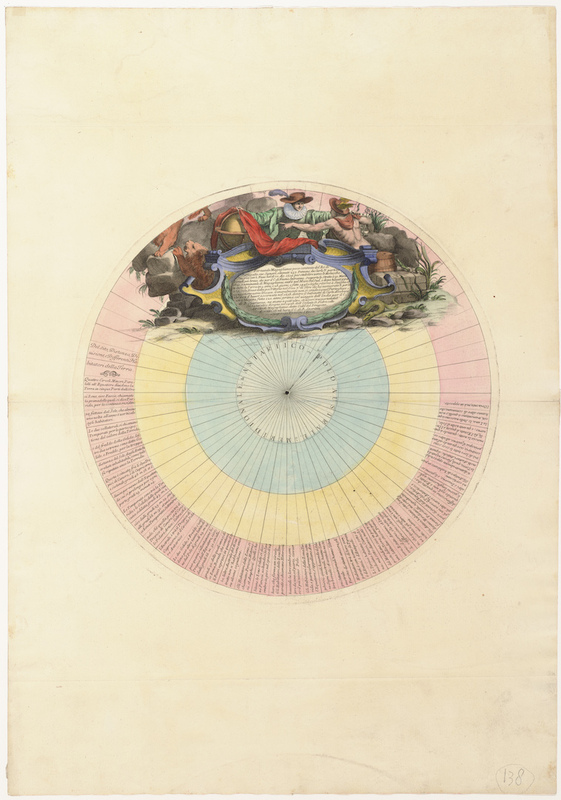 The plate would later be sold to Hondius for use in the Mercator–Hondius atlases. The situation as described for the preceding Ortelius map is once more confirmed. Note the subtitle India Nova for North America. Tierra del Fuego, south of Magellan Straits, is considered part of Terra Australis. 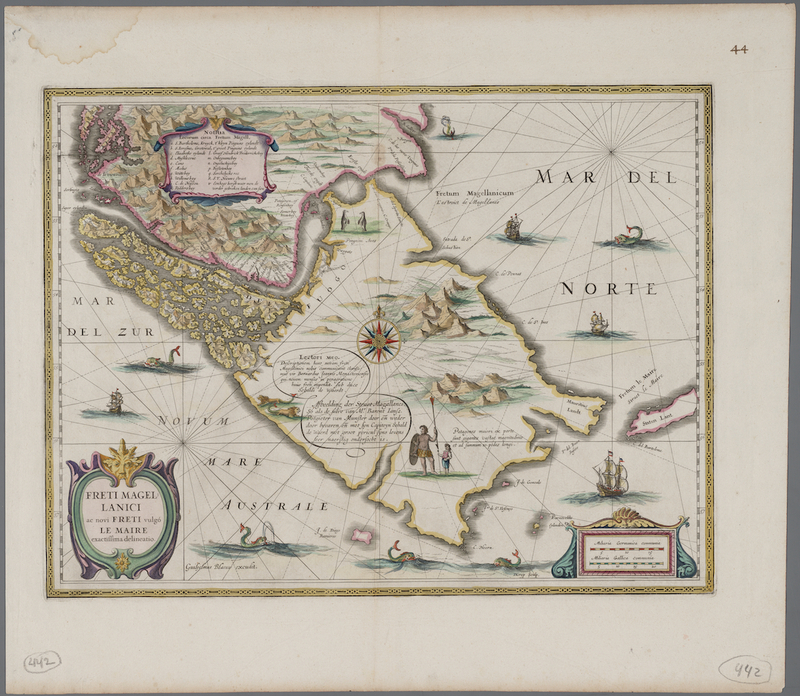 This map was published in Blaeu’s Appendix to his Atlas Novus in 1630, to be replaced in the next edition already. The information originates from a 1600 voyage by Sebald de Weerdt and others and is augmented with information supplied by Isaac Le Maire (1615–17) The 10-feet tall Patagonian giants are displayed and Staten Lant is shown, presumably attached to Terra Australis. Only in 1643 was Staten Lant recognised as an island when Hendrik Brouwer sailed around it, proving it unrelated to the Southland. Brouwer’s Passage was later renamed Drake’s Passage. This map is by Jansonius c. 1655. The full coastline of earlier years is now replaced by a string of islands, providing ample space south of Tierra del Fuego, which now remains separated from the mainland. Spanish discoveries in 1576 are duly acknowledged; the coastline of Terra Australis is no longer there in this region. In Jansonius’ 1654 map the real Australia appears in outline for its north, south and west coast had been discovered by the Dutch by that time, then known as Hollandia Nova. The penguin at the lower right suggests intimate knowledge of Antarctica but no doubt has a different origin (South America). The solid delineation of Terra Australis is replaced by a thin line with various interruptions where recent discoveries made the earlier coastline untenable e.g. 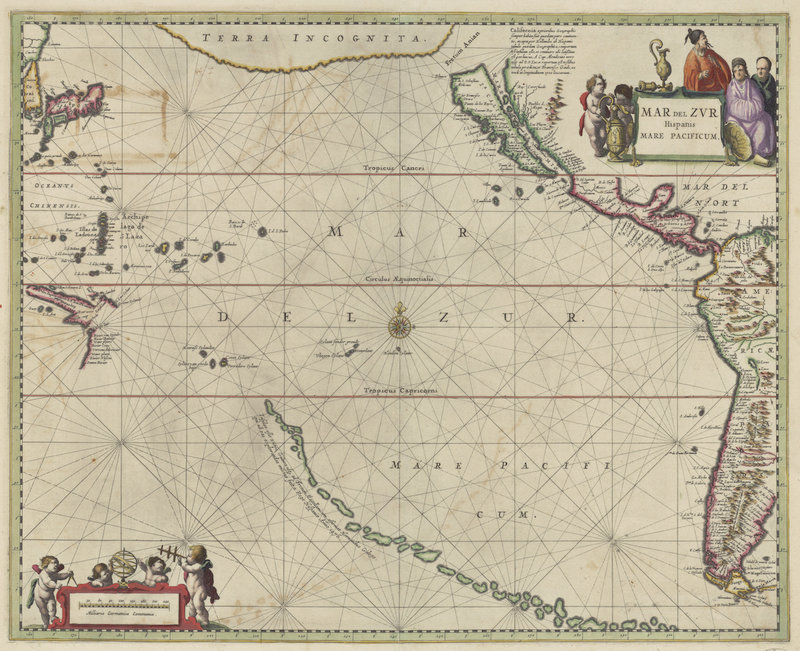 after the discovery of Cape Horn (1616), the Pacific explorations by Hernandez Galego (1576) and De Quirós, the Dutch routing from the Cape of Good Hope to the Dutch East-Indies and the exploration voyages by Tasman in the 1640s. The south-polar calotte of a large diameter Coronelli globe, 1688. Coronelli states elsewhere that as nobody has ever been out there, he will keep the area blank altogether, although he provides multiple information, some of debatable origin, in the outer circular band of the image. The upper cartouche describes Magellan’s voyage with the ship Victoria (1519-1522). 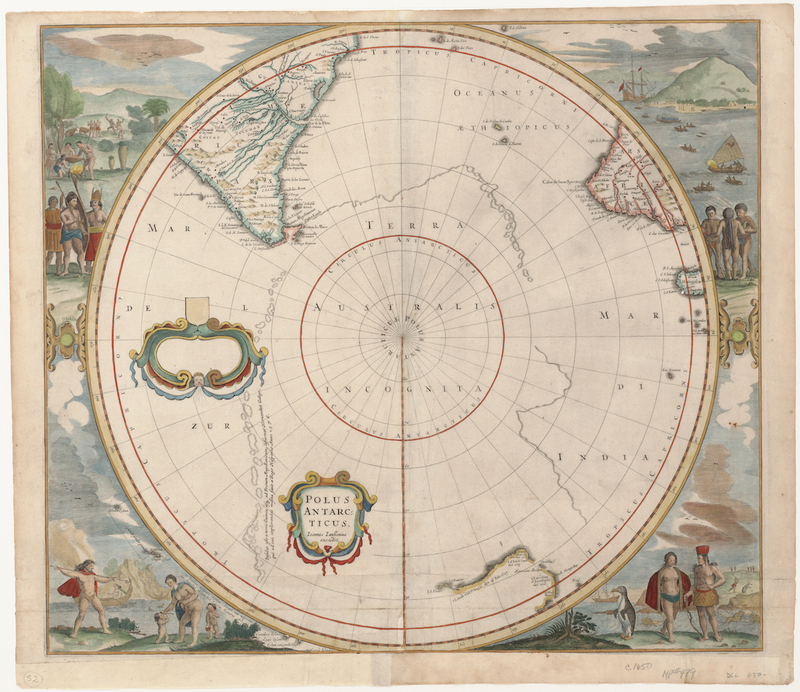 This 1714 map by De l’Isle was published by Covens and Mortier in Amsterdam. 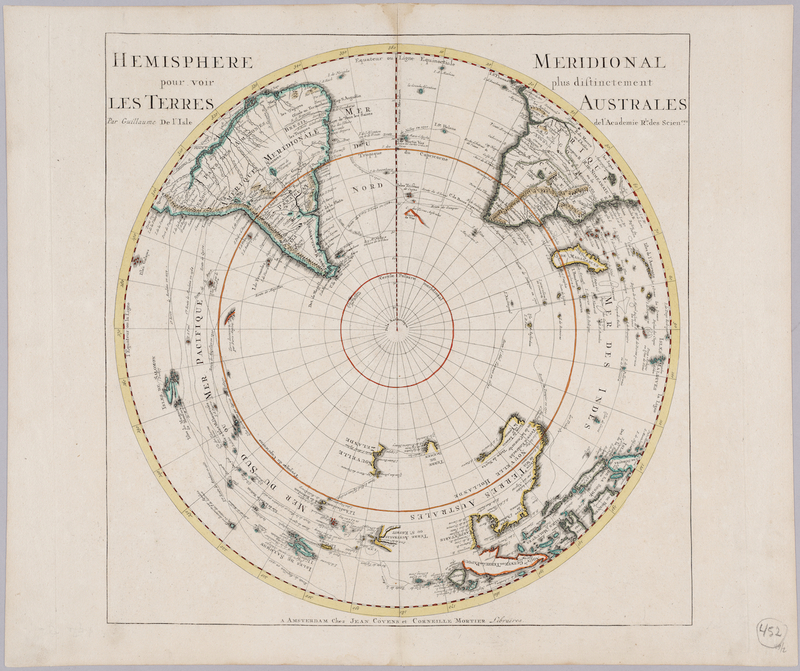 The contours of Terra Australis Incognita have disappeared and of Antarctica there is not yet a trace. The routes of Magellan (1519), Le Maire (1615/17), Abel Tasman (1643), Dampier and Halley (1700) are identified. The real Australia (Terres Australes) is shown in coastline (omitting the still unknown east coast). A single reminder is found in the South Atlantic Ocean: C. des Terres Australes.